Here is one of our favorite tapa recipes from Andalucía, the southern region in Spain. 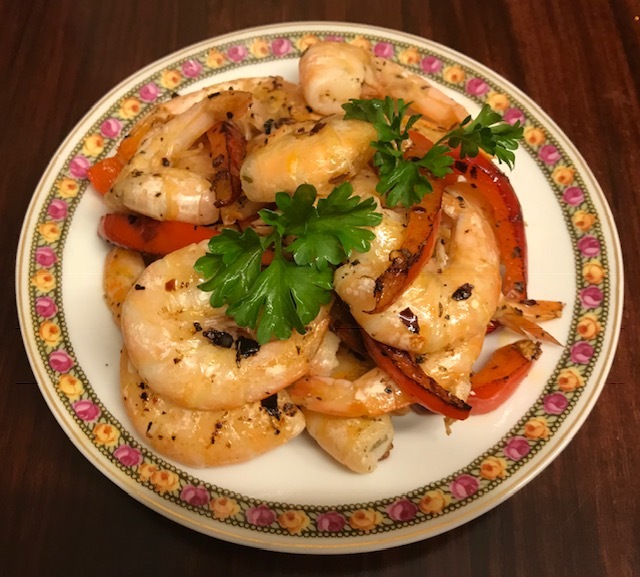 It is simple and quick to prepare and with good quality shrimp, terrific. Heat a sauté pan to medium-high heat. Add oil and sauté the peppers and chili flakes for 2 minutes. Add shrimp and oregano, stirring occasionally, and heat for 2 minutes. Finally, add garlic and heat another 1 minute, until shrimp are cooked. Remove from heat and serve hot. Wild mushrooms, (in particular setas) are very popular in Spain. After an autumn rain, many people drive or walk out to the countryside and spend the day picking them. I grew up in the Pacific NW picking chanterelle mushrooms with my dad, so I appreciate this traditional way of gathering food. It was fun, and once cooked at the end of the day, the mushrooms tasted amazing. Fall is a great time for mushrooms recipes. Visit your local market and find out what options you have available. 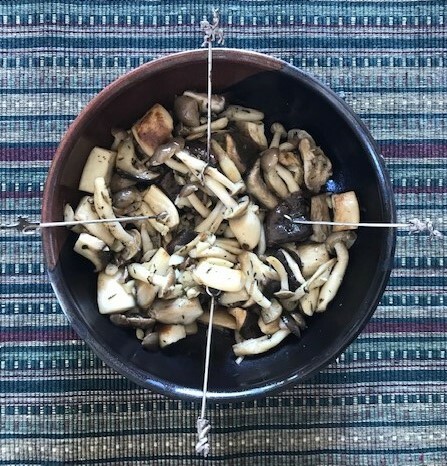 Consider setas, oyster, shiitake, chanterelle, beech, and maitake varieties, but you can also use traditional cremini or baby portobellos, or button mushrooms in this recipe, too. Heat a large sauté pan to medium-high heat, add mushrooms, stirring occasionally. As they begin to soften, about 3-4 minutes, you might notice that the mushrooms start to make a squeaking sound as they shrink in size and are stirred. At that point, reduce heat to medium; add olive oil, thyme, and garlic. Continue to stir intermittently for 2 minutes. Before garlic browns, add salt, white wine, and stir. Continue to cook another 3-4 minutes. Serve immediately while hot. Both sound yummy! On our way to Barcelona next week! Imagine I’ll be fixing more tapas after that. To commenter Diane – From another “Diane”, I could have written what you said! We just returned from Barcelona this week and thoroughly enjoyed the tapas we had there. I’ll be fixing more tapas too!